Rho activation in Swiss 3T3 cells. 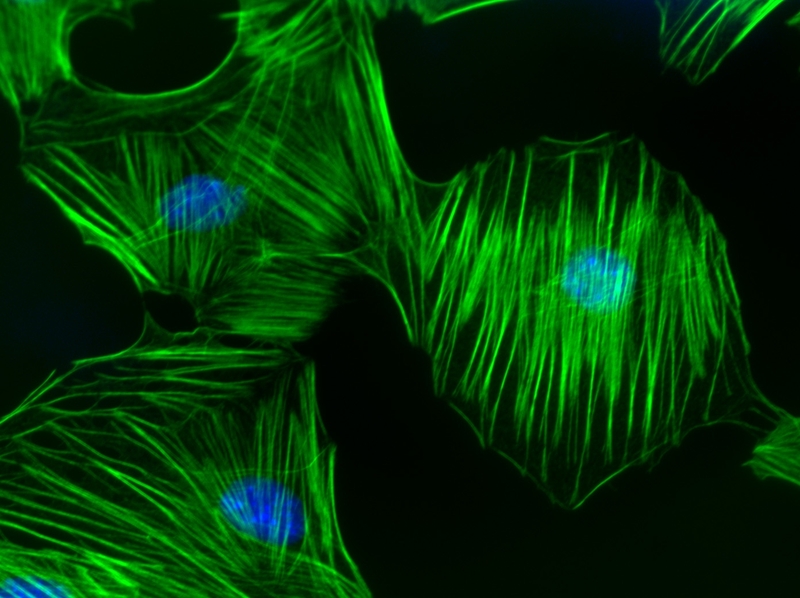 F-actin is visualized with fluorescent green phalloidin staining (Cat.# PHDG1) and nuclear blue DNA staining with Dapi. Cells were activated with Cat.# CN03. Corvol et al. investigated the gene Family with sequence similarity 13 member A (FAM13A) and its contribution to the pathophysiology of cystic fibrosis (CF), a monogenic lung disease characterized by an excessive inflammatory response. Disease severity varies and is influenced by genetic modifiers. Here, the authors confirm that FAM13A is a genetic modifier of the CF lung phenotype and can impact the severity of lung disease in CF patients. To mimic inflammation that accompanies CF, lung epithelial cells and primary human bronchial epithelial cells from CF patients were treated with IL-1β and TGF-β, pro-inflammatory cytokines. Each cytokine decreased expression of FAM13A. FAM13A has a Rho GTPase activating protein (GAP) domain, prompting the authors to measure RhoA activity and associated F-actin stress fiber formation following siRNA-mediated reduction in FAM13A expression. An increase in both occurred, whereas E-cadherin expression decreased. Additionally, TGF-β stimulation of siRNA-treated cells displayed a further reduction of E-cadherin concomitant with increased expression of α-smooth muscle actin and vimentin. These changes are characteristic of an epithelial to mesenchymal transition. Cytoskeleton’s RhoA pull-down activation assay kit (Cat. # BK036) was essential in identifying a molecular pathway underlying FAM13A-mediated alterations in CF lung phenotypes. Corvol H. et al. 2018. FAM13A is a modifier gene of cystic fibrosis lung phenotype regulating rhoa activity, actin cytoskeleton dynamics and epithelial-mesenchymal transition. J. Cyst. Fibros. 17, 190-203.